It all began when my father pointed out to me, that we have this plant in our backyard, which grows very fast and multiply very quickly. This plant and its off-springs are taking over much of our garden space. 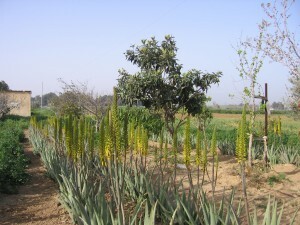 It is the Aloevera – the “miracle plant”. We live in a village where we are surrounded by uncultivated agriculture lands not being used for many years by now. Once in a while, we come up with an agriculture idea, when we talk about planting an orchard and grow some kind of a fruit, or raising something else. But somehow these talks remain only thoughts, and soon forgotten. Both me and my father are busy in our own jobs (not agriculture), and despite the fact that we have fields behind the house, we actually do not really cultivating or using them. Every now and then we are sorry that we do not utilizing these fields, and we continue on with our every days’ businesses. But at that day (3 years ago), when my father told me, about the Aloevera, something was moving inside of me. I heard a voice within me telling myself, that this time, it is different, and it is a time to check. Seriously. As most of you probably know Aloevera gel is very good for healing burns. This is what I knew, but I discovered more. Much much more. At that day, I sat in front of my computer and started to search Google for information about Aloevera. While surfing into the small hours of the night, I discovered amazing stuff about Aloevara. I have learned that Aloevera is not only good for burns but also for numerous skin treatments (like cuts, bites, eczema and other skin complaints), and also for healing the inside of our body. The next day and on, I was reading more and more on the internet, gulping all piece of information I could possibly find. 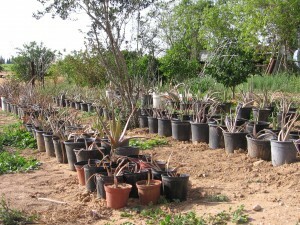 From planting and growing Aloevera plants, taking care of it, and to various uses of Aloevera. 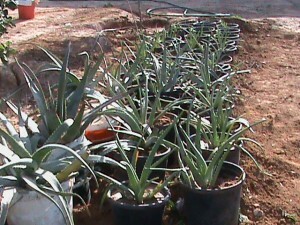 I was really fascinated and started to build a dream, where I’m growing Aloevera fields and make products with Aloevera pure gel. As before, my father was a little skeptic, but this time he cooperated with me on this. And within few weeks we already had a “small” garden-bed with about 100- 150 Aloevera plants that were taken originally from our backyard’s “messy crowded orchard” of Aloevera.